Dedicated volunteers sort, tag and sell children’s and maternity clothes at our biannual Nearly New Sale. Pictured here, from left, are Michelle Palmer, Margery Donovan and Kate Rice. 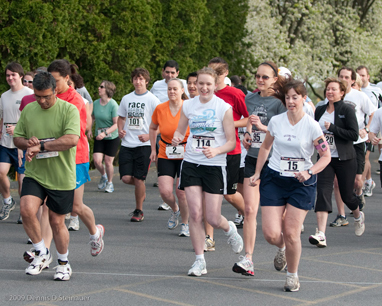 The YWCA’s hosts three road races a year which benefit racial justice programs, our general operating fund and our Encore breast cancer support group. These races are ideal for new and experienced runners. Many people enjoy challenging their friends and trying to beat their personal best time. In addition to our year-round and seasonal programs, the YWCA staff works hard to organize special events that not only benefit our organization through fund-raising, but also give our members the opportunity to stock up on children’s and maternity clothes at a low price, challenge their friends in one of our three races, spend a day playing volleyball in our annual tournament, learn about the past year’s successes and plans for the upcoming year at our annual meeting or spend a night with family and friends while learning about different cultures at our cultural celebration nights. The YWCA is always looking for new events that are fun, economically feasible and ideally raise money to support the programs we offer to the community for no charge. If you have any ideas, or would like to volunteer to organize any of our existing events, please let us know. Contact information for event organizers are on each of the event’s respective page.